UPDATE: Please note some of the models below may be older or discontinued. To read our expert reviews of the latest Sole ellipticals just follow this link. Transporting and assembly: The Sole E25 elliptical trainer is heavy; I picked it up at the store and then moved it from my rig to my exercise/office room on the first floor of my house with help from another strong fellow. Moving the big piece up two steps was a struggle and awkward. I assembled the Sole E25 by myself in about 4-5 hours. I bought from Menard's a 24"x 62" custom cut runner to prevent marring of my oak floor. The instructions said (on page 2) do not place on deeply padded, plush or shag carpet. Consider this before you assemble. One must have at least 2 feet of clearance especially near the lift bar area. I have a cordless drill/screwdriver which really helped. There was a glaring error in the instruction booklet. The Assembly Tools figure on page 7 (for the Sole E25) and on page 15 (for the Sole E35) are identical except the ID #s are different. Through out the assembly I was searching for #184, 187 and 185 but found them to be identical to #159, 162 and 160. Sole should simply substitute the page 15 figure into page 7 to solve this error. Make sure you torque down every nut and bolt before you put the plastic covers over the unit. Long handled wrenches definitely would help. I suspect a few weeks later I will have to remove the plastic covers to tighten loose nuts. Workmanship: The equipment is built with quality. It is made in Taiwan (MIT) but engineered with precision. Everything aligned properly. The E25 does not have the two degree inward angle footpads, adjustable heel support angle and heart rate transmitter. Some review sites misinformed readers that some of these E35 features are also in the E25. Since I am limited by space in my office (21 inches by 60 inches for the E25 while the E35 is another 10 inches longer) I have to buy the shorter unit. Operation: The fan will not cool you down. It has a low humming sound and could interfere with music listening. The unit glides smoothly. My first attempt was a short 10 minute check out. It performed flawlessly. I have been doing 15 minute segments two to three times every other day. It is doing well. Make sure you keep the unit clean by wiping down periodically. The gliding tracks especially should be kept clean. A small piece of dirt got on the track yesterday and I heard the rhythmic thump. A little rubbing alcohol and fresh lubricant took care of that annoyance. Overall: The Sole E25 elliptical is a decent piece of exercise equipment. At $1000, it is not small change. I am glad I did the research and took the advice of allellipticals.com seriously. Want to start a new discussion? Just click here to visit Elliptical Trainer Consumer Reviews - Rave or Rant!. I love my new Sole E35 elliptical. I'll start with this, I am 40 years old, 5'7" tall and weigh 350 lbs. I bought this on 6/25/10, arrived 7/2/10, very fast shipping. I have been looking at ellipticals for about 6 months before buying this one. The E25 looked inviting but for $300 more (E35) it comes with automatic everything and a better warranty. Lot of reviews that I read quibbled about putting it together. Mine was assembled in under 2 hours by me and only me. The Sole E35 is also very quiet, unless you don't tighten all of the nuts and bolts. I read one review about the downward slope of the pedals and I do have to agree that sonmetimes my feet are fatigued by them. It is something that I can live with. The overall performance of the machine is the best. I've been on other ellipticals and they felt like they would just fall apart after 10 minuets. Not this one, the Sole E35 is very solidly built. I feel very confident that this machine will get me to my goal and maybe beyond. Easy Set Up To Go Go Go..! Received our Sole E35 a week ago but only moved it to our basement yesterday. It is heavy and I nearly hurt myself moving it and definitely recommend getting assistance. Setup was quite easy actually only taking about 2 hours from opening boxes to final plug in. What a smooth running machine that looks great..! We definitely recommend the Sole E35 to anyone who wants a great workout. My husband and I have used ellipticals in gyms for a few years now, and over time, we began to like them a lot better than regular treadmills. When we decided to buy an elliptical, we did our homework. We went to every store we could find that sold any kind of elliptical and tried them out. If we liked one, we came home and did online research. My husband was leaning toward a Precor model that we tried at Sport Chalet - but on "sale", it was selling for $4,000. I think that's way too much to spend on home gym equipment. We got Consumer Reports reviews of ellipticals, too, and then started researching the ones they recommended or said were "Best Buys". Number two on their list was the Sole E35 elliptical trainer, so I did extensive online research of Sole ellipticals. I found a few trainers' reviews - and they all really liked the Sole. The model most of them were suggesting was the Sole E25, which they said ran around $1,000 - but was more than worth the money. We read every consumer review that we could find - and there was barely a negative word written about the Sole E25 or E35 elliptical trainer. In fact, the only negative comments we found were regarding assembly. In 2004, I was single and purchased a treadmill - a new model that was like a stair-stepper - and my 12 year old daughter and I had to put it together. It was heavy and awkward and I had absolutely NO experience putting anything mechanical together. It took us many hours. Sadly, there were many problems with those early treadmill models and my machine was repaired several times and finally completely replaced by the company. I used the heck out of it - but it was never a very good machine and in 2004, I paid $2,000 for the mid-range model. My husband and I finally went to the source - the Sole Fitness website and we were VERY pleasantly surprised by the price of the Sole E35 elliptical trainer and the free shipping to boot. Being that I did NOT want another experience like the one I had with the Treadclimber, my husband and I decided to pay the extra $239 for the "turn-key" delivery, where the elliptical was brought into the room of our choice and assembled. The day it arrived, the freight company sent two big burly truck drivers to assemble it. They were very nice guys, and though they said they had never assembled one before, they did a great job putting together our elliptical. I am so happy to be writing this review not having to complain about the assembly nightmare. Been there, done that. We chose the Sole E35 over the Sole E25 because of the heart monitor, the fan, the MP3 hookup and speakers and the cup holders. The fan isn't that great - it can't be adjusted for height and there is only one speed - but we do like the other features a lot. Best of all, this elliptical trainer is even better than the ones we've tried at the various gyms we've used. It is a smoothe, gentle ride to say the least. Don't expect an easy workout - but you have SO much variety on the Sole E35 elliptical trainer, you can keep your own pace. For me, I love that I can set up my own workout, based on my age and weight, and I can set the incline and difficulty levels as high or low as I want and also set the time of my work out. After I do a moderately difficult workout for 15 minutes, I just set the elliptical to manual and do whatever I want for as long as I want. If you press STOP, it will pause your workout and then you can press START to continue where you left off. Another great thing about it is if you do stop your workout - to take a drink or a phone call - you can still pedal at a lower pace until you're ready to continue. You never have to completely stop. I love that! I couldn't imagine owning another elliptical. This is so worth the money. My hubby and I use the Sole E35 elliptical trainer every day - and gone are the hassles of the crowds at the gym or the long drive to get there. I'm sure anyone who buys this elliptical is going to love it. I am 54 years old, 6'2" tall, 285 lbs., a pretty big man. I've been somewhat of a "treadmill" fan for most of my adult life and have owned three different models over the years. Last September hurricane IKE rolled through my home town and brought with it 4 ft of flood water, that whipped out the first floor of my home AND my most recent treadmill. I started researching a replacement and simply thought I'd give one of the new ellipticals a try. The positive reviews, good warranty, and high weight limit led me to the Sole E35. I ordered my 2009 Sole E35 elliptical trainer online from Sole Fitness (free shipping) on 5/28/09. I found the salesperson to be polite and knowledgeable and was told to expect the unit to arrive in "a couple of weeks". I was quite pleased when my unit arrived a FULL WEEK earlier than originally promised. The factory might suggest otherwise but I'm here to tell ya.... assembly of this thing is no walk in the park. I had access to an appliance dolly and figured as long as I could get it in the house and into my "spare bedroom", putting it together wouldn't be a problem. UGGG! The instructions are adequate, I found them overly detailed though and at times confusing. The real problem however is dealing with that giant "wheel assembly". The footrests and all the "arms and levers" are pre- assembled (attached) to that giant "wheel assembly". This makes for an EXTREMELY awkward and VERY heavy unit that you really need 2 people to properly handle. I did finally manage to get that monster out of the box and assembly went pretty smoothly after that. It took me about 3 hours to assemble, GET A HELPER! As I stated in the beginning here, I don't have any experience with other ellipticals for comparison. Having some treadmill background though, I am pretty familiar with the electronic "consoles" and user features that normally come with exercise equipment. One of the few complaints I've read about this unit is some users feel the control console is somewhat primitive. I think the 2009 model was upgraded but it's still nothing fancy. I found it very adequate for displaying the basic information. I leave it in SCAN mode and it cycles through the info. It would have been nice if you could set SCAN as the default. As it is you have to set it up every session. Not a big deal just a suggestion. There are a few important features that I think make the Sole E35 worth the few hundred dollars extra over the E25 elliptical trainer. 1) The HEART RATE MONITOR is one of them, it is VERY VERY NICE, much more accurate than having to squeeze the palm sensor. I haven't used the heart rate control programs yet but I wear that monitor EVERY workout, IT IS GREAT! 2) The FRAME is heavier on the E35 and really built for a big guy like me. 3) I really like the ramp and tension adjustments in the handlebars, that is worthwhile and very nice feature. The Sole E35 elliptical is smooth and sturdy. I have it on a tile floor. One thing I learned was that getting the unit perfectly level was important for eliminating noise. I had a few creaks at first but once I got it settled in and level the little noises are gone. I have been walking on this unit (25 to 30 minutes) nearly every day for almost 2 months now. I've actually lost about 15 lbs. and I am really liking this machine. One thing I would like to comment on is this. I read where the engineers designed the adjustable footplates because some users were complaining about their feet going to sleep. I personally find the footplates to be angled "FORWARD" too much. The adjustments don't really help me because they need to adjust BACKWARDS a couple of degrees. What happens is my toes keep getting crunched up in the front of my shoes. I have to take my weight off of each foot and sort of drag my feet back into proper position in my shoe. This is a minor problem though, certainly not a deal breaker. 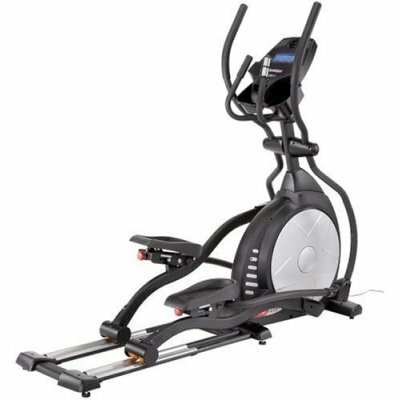 In summary I think the feature set on this Sole elliptical trainer is very adequate and this is a nicely balanced unit at this price point. I've only had it a couple of months but I have been very pleased with my purchase and would definitely recommend the Sole E35 elliptical, especially to any of you big guys like me. I bought my Sole E35 elliptical locally. But it's hard to beat online pricing with free shipping and no tax. I did negotiate with a local chain sports store for $100 off down too $1200 plus tax which put me about $17 over the internet. Not bad for wanting it right away. So do try to haggle with local shops. Please note I did haul it home myself. The Sole E35 weighs almost 300 lbs so make sure you have a vehicle to carry it. You must have help removing this bulky box from your vehicle. Open the box and carry all the parts to the assembly area. The flywheel is very awkward, I read other reviews about removing the arms which made things much easier. One screw removes the cover and one bolt holds the arm in place. You will need an Allen wrench. I borrowed I believe was a 9mm Allen wrench that fit. Remove the arms and now you have just the flywheel (approx. 30 lbs) which I carried down the stairs myself. Assembly of the Sole E35 is straight forward, about 3 1/2 hrs alone while watching TV. Having a good set or ratchet wrench both American and metric sockets helps a lot, also a good set of Phillips screwdrivers should be used as well. The tools provided are cheap, the stubby screw driver won't fit. Buy some good tools if you need to. Tighten all metal to metal screws as tight as possible. Do not over tighten the plastic covers as they could crack. This machine is very solid and should last for years. 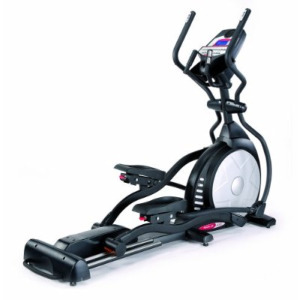 If you want to buy the Sole E35 elliptical do not worry; it's well built and looks great. I have a Sole E95 and I find the tension even on Level 1 too difficult. I use an elliptical at the gym and can stay on an hour at Level 4. On mine I am feeling tired after 10 minutes. Any help would greatly be appreciated. I love the Sole E35 elliptical. Definitely gym quality at home. Quiet, easy to use, and very smooth. Fan could be stronger. Be prepared to spend up to 4 hours assembling with step by step instructions. I wish I had spent more time on this machine before I bought it. It felt OK in the store when I tried it for a couple of minutes, but after about 10 minutes into a workout I can't get over how much my quadriceps burn in the front of my legs. It seems like the pressure is always on the balls of my feet (because the machine makes my posture lean forward a bit) and hence the load on the quads is never relieved. This makes for a really uncomfortable workout because those quads are really built for power and not endurance. For endurance you really want to involve the glutes and hamstrings more. I think this is really the biggest difference between the front flywheel machines and the rear flywheel machines. I'm hoping I can return this machine. 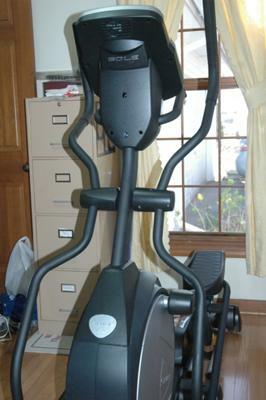 My husband & I purchased the Sole E35 elliptical in January 2010. We ordered directly through Sole and chose our menthod of delivery without a problem. The machine worked fine and was used daily for 14 months until it broke. We called Sole that day, and after trouble shooting with my husband they said the part would be shipped that day and we would receive it in 3 business days, and that someone would be in touch with us about getting our elliptical fixed. Danielle from Atlantic Fitness left a message later that day saying that as soon as we received the parts, to call her and a service call would be scheduled. We did receive the parts for the Sole E35 within 3 business days, and I promptly called Danielle. She said the service man Jeff had a very large territory, and to give him two nights to call as he is so busy that is when he schedules his appointments. Two nights came and went, and Jeff did not call, so I called Sole Customer Service and asked for another service provider as it seemed Jeff was too busy. Jeff called me that night and said he could be here the next morning at 8 AM, which worked well for me. Jeff came and had to leave without fixing the unit as the part we had received wasn't what was broken. Jeff said he had to order more parts, which he did, and again we received them in 3 business days, and I again promptly called Danielle & told her. Again she said Jeff would call us that night or the next to schedule an appt, which didn't happen. I called Atlantic Fitness again today, and was again told that Jeff works well into the night and has a huge territory. Jeff was very nice and seems like he knows his stuff, but my complaint is the waiting time for him to fix the machine is ridiculous. Two weeks ago today we called Sole to report our broken machine, and yes, they have been very responsive, but if they use a firm without enough help for service, what good is it? As of now, 2 weeks later, we have no service appointment to fix our machine. We didn't expect the machine to break within 14 months, we bought the Sole E35 because of its good reviews & Sole's reputation, but stuff happens and now we wait...and wait...and wait to have it fixed. I'm so glad we're still under warranty, I would hate to be going through this service time and $$ if the machine weren't covered. I ordered this elliptical from Sears 3 times (had to do it over 3 times). You've heard 3rd time is charm...not true here. Sears was supposed to deliver and set up this machine, called me for a delivery time between 4:30 and 6:30 pm on Friday 7/19/13. Six-20 came and no delivery. We called the delivery department and was told they were running late. Why didn't the delivery man have the common courtesy to call and let us know he was going to be late. After waiting 3 hours to hear from "anyone", he called and said he had one more delivery to make at 9 pm and would be to my house after that, which meant it would be after 10 pm. Between the calls to Sears delivery and to their main office and no satisfaction, we finally told them to cancel the order and refund us for the equipment. I was not about to wait until 11 pm for this delivery. I waited for a week for this. I will never do business with Sears again and it's a shame that an elliptical that I was looking forward to will no longer be in the spot I cleared out for it. Customer service does not exist anymore. When we baby boomers die off, I hate to think what it's going to be like in the next 20 years. The supervisor actually told my husband on the phone, "tough luck"! It took my husband a while to calm down and he's a heart patient. Sears, you stink and will be going the way of Montgomery Wards and J.C. Penneys! I purchased a Sole E 25 in October of 2013. The machine gives a great work out and gets really good reveiws. Unfortunately it does not hold up even under moderate use. At around 850 miles the aluminum cladding on the runners that the rollers glide on started to crack. The cracked aluminum tore up the rollers to the point of failure. After a long and tedious back and forth I received replacement parts. 200 miles later the same thing is happening all over again. Bottom line - I will never buy a Sole product again. We have had the Sole E20 for about 14 months. It is a great workout in a short span of time. 30 minutes of hard running will make you feel great. The problem is, it's broken now. The right wheel keeps going off the track and I can't use it anymore. It's been retired as a coat hanger. Maybe I'll spend a little more on my next elliptical. I have had mine for less than six months. Today the incline showed E3 and smelled like it was burning up. The incline raised as high as it will go on its own and I cannot get it to go down. The company told me they could not send anyone out until I send them a proof of purchase. I did not know I had to send this initially when I registered the machine as those instructions were not available. I now have to find it, adding additional time to getting it fixed. I am sure it will take awhile. I thought I did my due diligence when purchasing the machine but will not buy another one. Sorry to hear about your troubles, Jammer. We have received a few complaints about Sole over the past few months but in general they are a very well received brand known for the quality. Let's hope they turn it around and work on delivering the solid construction customers have come to expect.